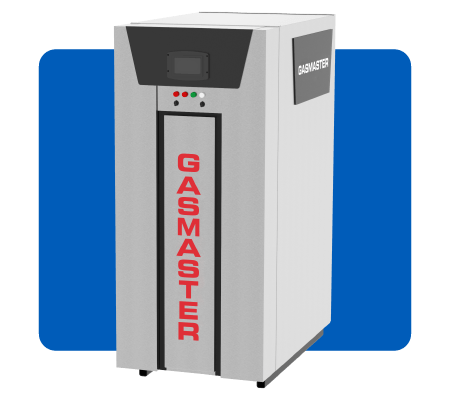 Gasmaster Industries condensing boilers are innovation-award-winning hot water heaters with nominal ratings of 200,000 BTU/hr to 12,000,000 BTU/hr. Our heat exchangers are a state-of-the-art design that provides a unique counter-flow process and allows for the highest thermal efficiencies in the industry. 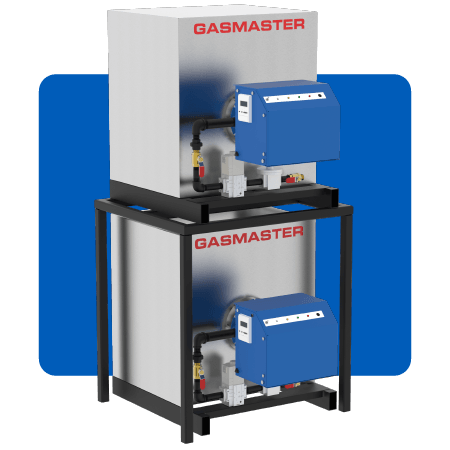 We offer over 25 different models, including dual gas and dual fuel options. The warranties on our products are some of the highest in the commercial water heater and boiler industry. Whatever your water heater needs, our sales and customer service team is ready to help you find the right unit for your next installation, and offer exceptional support after the fact. Above all, let us help you get the most out of your natural gas bill. 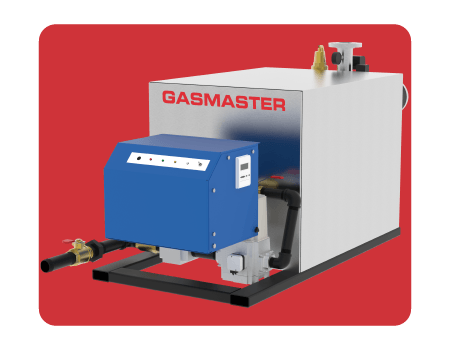 Gasmaster Industries was established in 1995. 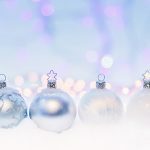 We are responsible for bringing the first 4 million, 8 million, and 12 million BTU/hr stainless-steel condensing boilers to the HVAC market in the late 1990s and early 2000s. 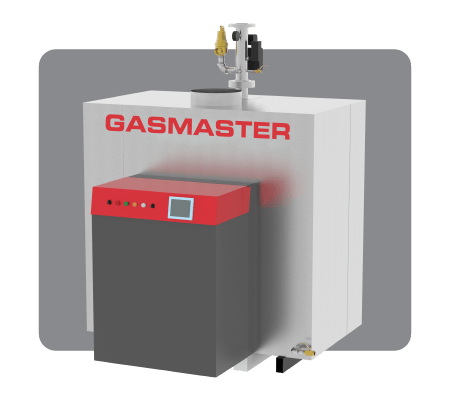 The award-winning patent-protect Radial Pulsed Combustion technology we use allows for Gasmaster hot water boilers to reach up to 99.8% efficiency during peak conditions. Our experienced engineers are equipped with 10 different certifications and are we happy to offer services such as boiler sales, boiler rentals, custom skids, and mobile boiler units. Our goal is to provide efficient, environmentally responsible heating solutions, and we are proud to offer these product solutions to clients worldwide. 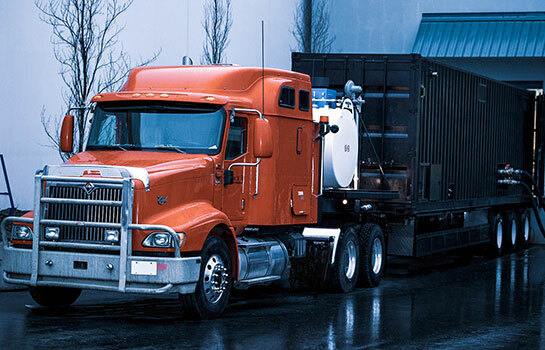 Our mobile boilers are ideal for rural or urban use; they have you covered wherever you need hot water. 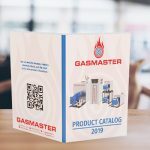 Built to your specifications and requirements so that you get exactly what you need, you can burn the fuel that makes the most sense for the situation – configurations are available in natural gas, propane, biogas, oil #2, and dual gas/fuel. By constructing with 316L Stainless Steel, our condensing hot water boilers become ideal for a variety of application not practical for boilers that use lesser quality metals. Therefore, industries that require the heating of deionized water or potable water will be happy to know that our boilers are excellent for use with these applications. 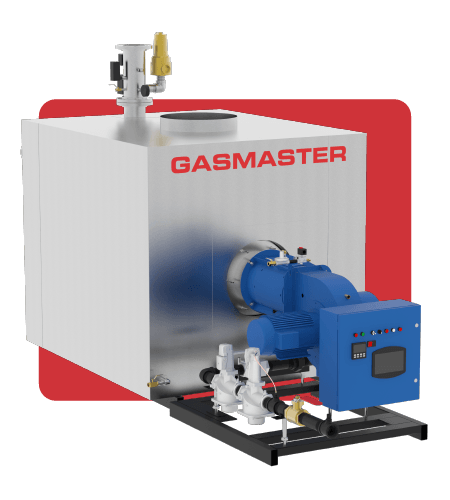 Gasmaster hot water boilers are made using 316L stainless steel, one of the best available materials on the market. The condensing nature of the boilers also allows for lower fuel bills, leading to considerable savings on your monthly utility bills. It’s important to us, as well as our customers, that our boilers are made to run as safely and efficiently as possible. Subsequently, our boilers are rigorously tested before leaving us, going through many stages of quality control before being shipped. Similarly, for all controls, safety, and accessory components we only use top world-wide recognized brands. Because of our commitment to quality, we have no reservations about offering the best warranty in the industry for hot water boilers. Above all, we want our customers to feel as confident as we are that our boilers will last. In our almost 25 years of business, we’ve gone through a lot of trial and error to make the products we offer today. However, we understand that not every client is as dedicated to (or has the time for) constant boiler research as we are. Which is why we are proud to post our research articles for free online. No sign up is required to see exactly why we’ve picked the materials we use, or offer the features we do. Secondly, we believe one of the best ways to motivate and teach employees is through lunch-and-learns. This is why we offer complimentary webinar and in-person workshop training for our clients. Sit back and let us treat you to a healthy, tasty meal, and a presentation on any of our topics of expertise.